Yamaha Corporation has had great success with a number of instrument lines stretching across a variety of instruments. In 1976 they introduced one such line of digital pianos called the CP series. These machines came to be affectionately known as the “electric grand pianos”, and went on to have much success. 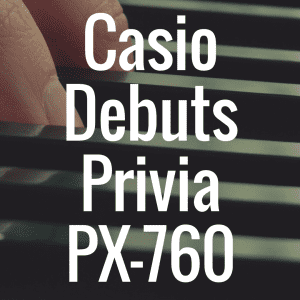 Thirty years later, in 2006, Yamaha unveiled two new digital pianos which encompassed all the great aspects of the series in the CP-33 and the CP-300. The CP-300 and the CP-33 are pretty much the same instrument, but the 300 can be characterized as the beefier version of the two. 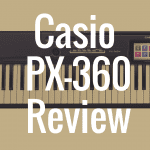 In my explorations into the foray of digital pianos I’ve been particularly drawn to the CP-33, which strikes me as a very powerful machine with a lot of impressive capabilities. I view it as a couple giant steps ahead of the Yamaha NP-31, which is a basic, entry level machine. The 33 surely is none of that, opening up a whole new world of functionality with its features. 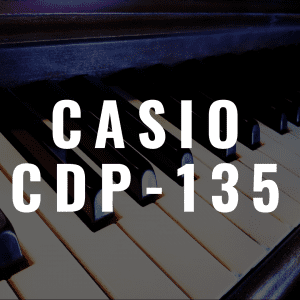 The CP-33 is certainly a real digital stage piano, and that is exactly where the piano makes its hay. It’s a machine that wants to make you look, think, and feel like you’re playing a real upright or acoustic piano, and it does a wonderful job. The piano contains Yamaha’s own GHE technology, which stands for Graded Hammer Effect. Every digital piano company is sure to have their own model for recreating the hammer action of a piano, and this is Yamaha’s own. When you first sit down on it you feel the sense of realism, although compared to most digital and even some upright pianos it has a bit of a heavy touch. But most seasoned pianists will soon adjust to this feel. 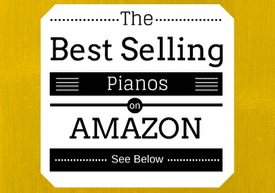 Below, you can compare the affordable available Yamaha CP-33 to the best pianos in its class based on weight, price, and even customer reviews from Amazon.com. The piano has a wonderful look and design to add to the feel of the machine. It has a simple, yet nice black finish, with a good number of buttons and knobs placed on the surface to help the user navigate the machine. One of the first things you’ll notice is the addition of a modulation wheel, a pitch bend control, and two zone control sliders. The zone control sliders are an innovative feature which works with the dual split and layer function by giving you the ability to control the volume for each section. There is a transpose function, which allows a player of any expertise to play a piece of music in any key without learning new chords or hand placements. There also is a handy click function, which acts as an internal metronome and holds a tempo of anywhere from 32 to 280 beats per minute. On the piano surface you’ll find there are 14 different voice buttons, along with an additional button for variation, making it a total of 28 resident tones for the piano. 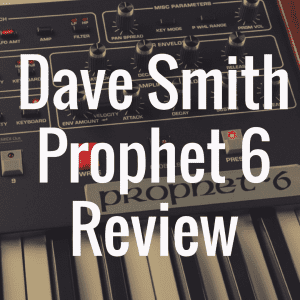 The varying tones range from a mix of grand pianos, electric pianos, and organs, to strings sections, choirs, guitars, and bass sounds. The keyboard holds up to 64-note polyphony, so there shouldn’t be any problems with dropped notes when playing. The grand piano tone, like most digital pianos, is the sound Yamaha has clearly focused on the most, using their wordily named Advanced Wave Memory Dynamic Stereo Sampling technology. The engineers have taken three different layers of samples from a full concert grand piano, and dedicated more than three times the normal memory allotment to cover every characteristic, from the vibration of a piano’s strings to the sound of the damper pedal. The data and connectivity capabilities of the CP-33 are absolutely wonderful, in my opinion. There are demo songs and practice pieces for each and every tone, so with about 30 files, you know you’re off to a good start in terms of internal storage space. The piano has a nifty USB port, which will allow you to seamlessly connect with any computer without any need for drivers or installations. One surprise about the 33 is that it doesn’t have double headphone jacks, which a lot of digital pianos have in order to allow duet practices or student-teacher sessions. This machine does have two output left and right jacks, which are a welcome sight for musicians looking to record their music or play directly into a camcorder or other device. However, the MIDI capability may be one of the best things about this piano. The CP-33 has the ability to transform into not only a capable MIDI controller, but a full length master keyboard. Yamaha has created a function where the piano transforms into ‘Master Mode’, where the keyboard can be divided into different zones which can control two different external tone generators. So even if you aren’t satisfied with the internal tones provided, you can gain a more than enjoyable experience through MIDI. The CP-33 doesn’t come with a pedal of its own, so you may have to purchase one of the four different piano style or foot-switch style sustain pedals created by Yamaha. In fact, this Yamaha doesn’t come with any additional accessories, so if you’re just starting out you may want to look into finding an ultimate bundle package through stores like KraftMUSIC. Those bundles usually come with a competent bench, stand, music rest, headphones, and sustain pedal. The only scary thing possibly about this digital piano is the price. The CP-33 has a high price tag, but don’t worry because you can buy the Yamaha CP33 for an affordable price (approximately $999.99 at certain online stores), which is an incredible deal. If you’re willing to risk it, you can look for more of a bargain price on sites like eBay, where I was able to find it for almost $200 less than that. Once you go that route, however, you can’t be surprised if it shows up on your doorstep with a dent or two. Even then, for the amount of value and professionalism I think I would still be quite satisfied having the Yamaha CP-33 in my living room. 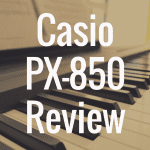 And lastly, please visit the Digital Piano Review Guide homepage for more great reviews. 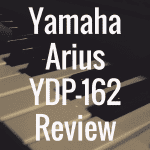 2) What Yamaha Digital Piano Is Best? 3) Digital Pianos vs Keyboards: Which is Better?